I'm planning on making something using both squares and half-square triangle units. If the squares I'm cutting are 5 1/2 inches square, then to make the half-square triangle units I want the squares for that to be 5 7/8, draw a line up the middle, sew 1/4inch next to the line then cut on the line; correct? Here's a chart to help you! Good luck! Isn't kitsie wonderful. I would cut it at 6inches just incase and trim down. I usually don't need to trim much - maybe 1/16 of an inch at the most. When I use the plus 7/8 instead of plus 1 inch - my HST units almost always end up skimpy. I think it's because when I cut around a template, there is a tiny bit of fabric added - when cutting squares in half - that extra isn't there. That looks neat, I'll have to keep that in mind for the future. As the project I'm currently working on will be my first quilt, I'm planning on a small lap quilt with mostly squares of brown and black, with a few half square triangle units of pink and black for a pop of color. I like that pattern. Looks nice and complicated, but relatively simple to make. One more block to add to my to-do list! Thank you, Kitsie, I printed it this time!! 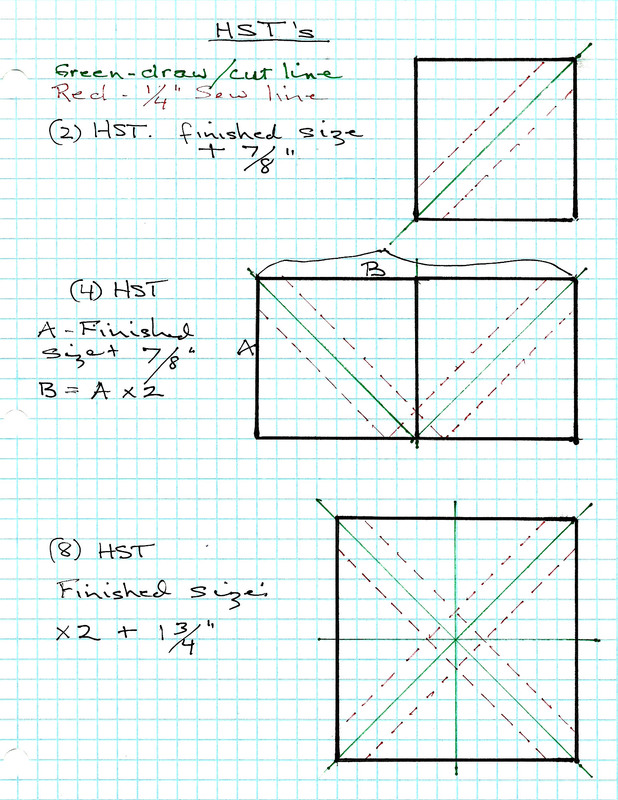 Joan -- I always add a full 1/2" instead of the 3/8" when I cut squares for HST. That way I can trim down the blocks, make sure the lines are perfectly in the points and if either my cutting or sewing is a bit off I have the extra. I agree...I add the inch to whatever I want the finished size to be and then trim. Makes for a much better block - at least for me. Not sure if it's my cutting or my sewing that is apparently not too accurate so I err on the side of caution. I can afford to give up an eighth of an inch of fabric. I would too - I always add a full inch then trim perfectly square. Whichever method you use, starch helps!!!!!!!!!! As I have aged, I now get confused with trying to figure the math part of quilting. I just try making a sample using scraps until I get it right.